NBC was only spreading the same lies as New York Times had previously done. 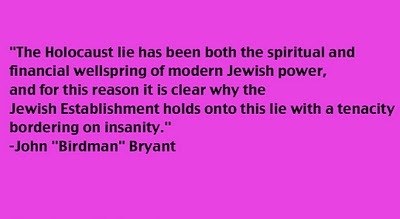 Such as when their inventor writer, John F Burns, mocked the existence of a Swimming Pool at the Auschwitz Vomitorium. The fact is, that behind Block 6 you can see an fully fledged competition swimming pool of which type today world championships are conducted. But Hitler’s Swimming Pool at Auschwitz Recreation Camp had more, it also had trampolines. Not bad for an ‘extermination camp’ which Stalin’s ‘gas chamber’, his Holy Shrine, was just close to the competition Swimming Pool. COOKING THE BOOKS. 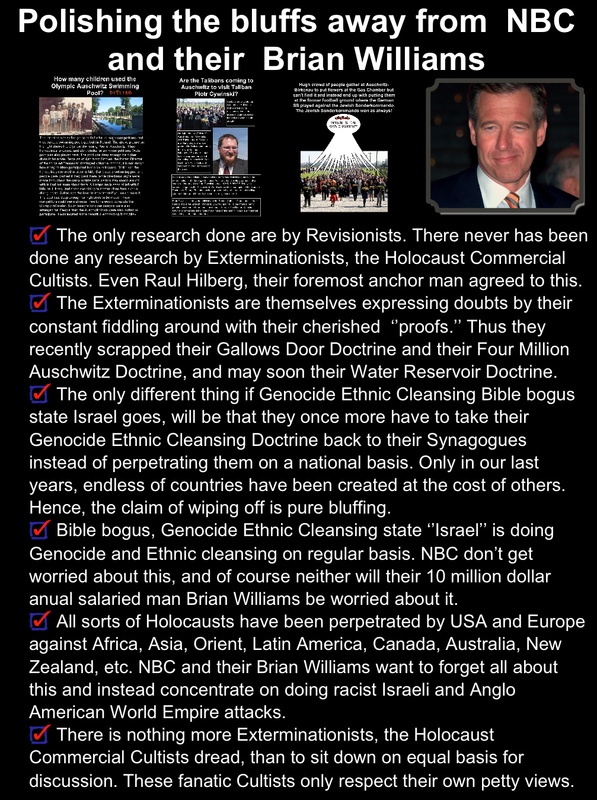 The reason why Brian Williams at NBC spoke to Ahmedinejad of Iran concerning the Holocaust Extortion Cult was for no other reason than that Zionism tried desperately to cover up the Pension Fraud Crimes, PFC, something way greater than anything Bernard Madoff ever cooked up. If you work for Censorship and make your money from it, you are not going to tell the public that the Charlie Hebdo Carnival was not for Free Speech but against Free Speech. Brian William’s lie to Iran’s Ahmedinejad that ‘we have scholars’ dealing on the Holocaust Extortion Cult, using Pension Fraud Crimes to extort money, when in fact, he hasn’t even got one and evidently did not even look for one, as perhaps he knew there were none. Brian Wilson of NBC told Ahmedinejad a bare face lie. 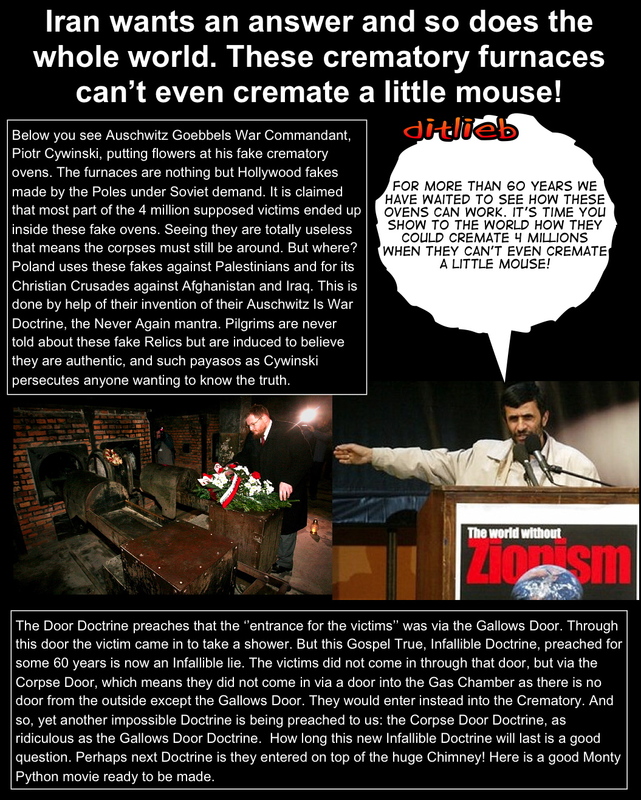 He haughtily told Ahmedinejad that there existed scholars who could ‘teach’ Ahmedinejad about the Cult of the Holocaust. Brian Wilson of course knew there are none such ‘scholars’ around unless he refers to himself. And it is clear that Brian Wilson could never before he met Ahmedinejad have spoken to any such scholars as they are like ghosts in the graveyards. 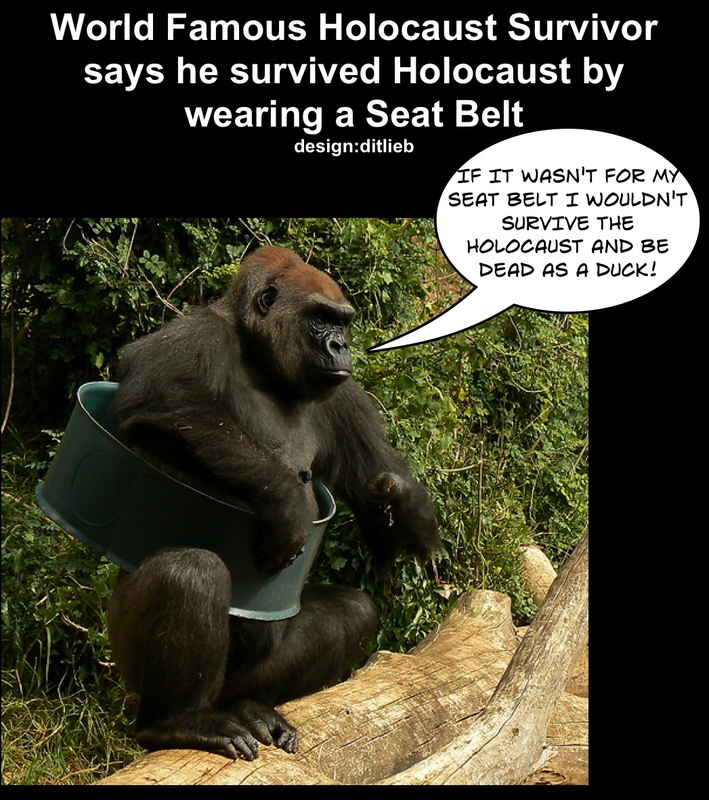 What is no less interesting, is the fact, that those ‘bravehearts’ of self-made ‘experts’ such as Holocaust Deniers Christopher Browning, Richard Evans, Raul Hilberg, Kershaw, Deborah Lipstadt, Robert Jan van Pelt, Peter Longerich, Laucence Rees, Wolfgang Scheffler, and others which you can find by tagging ‘holocaust deniers list’. And this denial started at a very early stage. 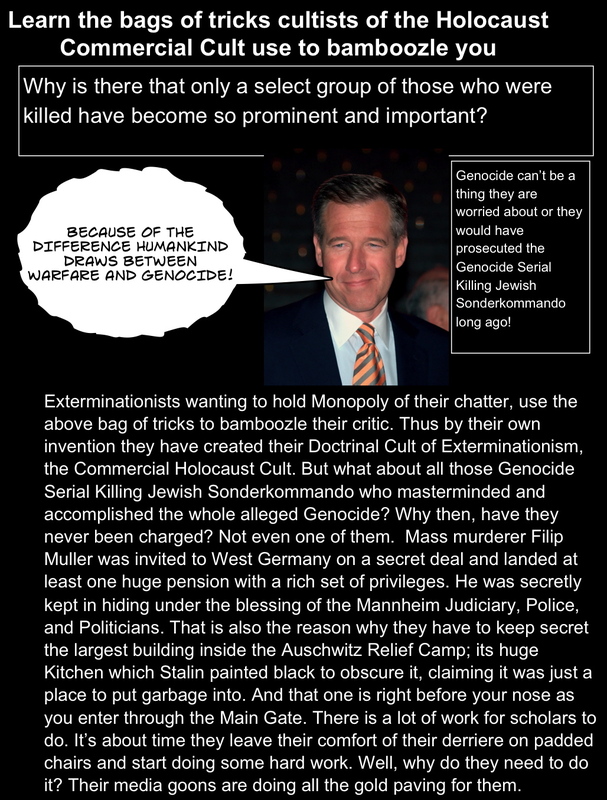 Already when the Father and Dean of Exterminationism, Stefan Szende, refused to discuss the Holocaust Extortion Cult over with Ditlieb Felderer. 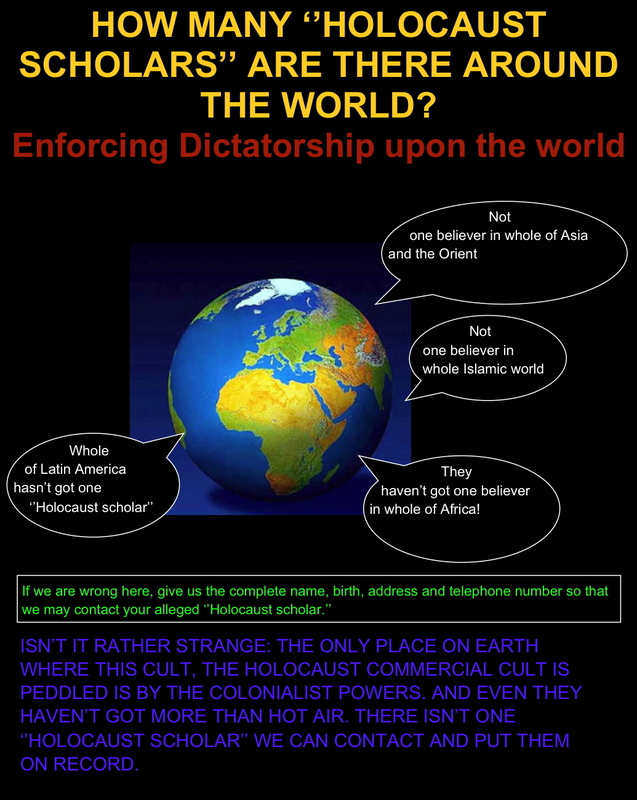 Later on, the greatest propagator ever for the Holocaust Extortion Cult, Raul Hilberg, did likewise. In other words, even if such scholars existed, there was a point blank refusal to consider discussing the matter openly. And if you wanted any information, you had to do it secretly as these con ‘experts’ had built an Iron Curtain around themselves. Which means, all that Ahmedinejad would be faced with were empty faces! 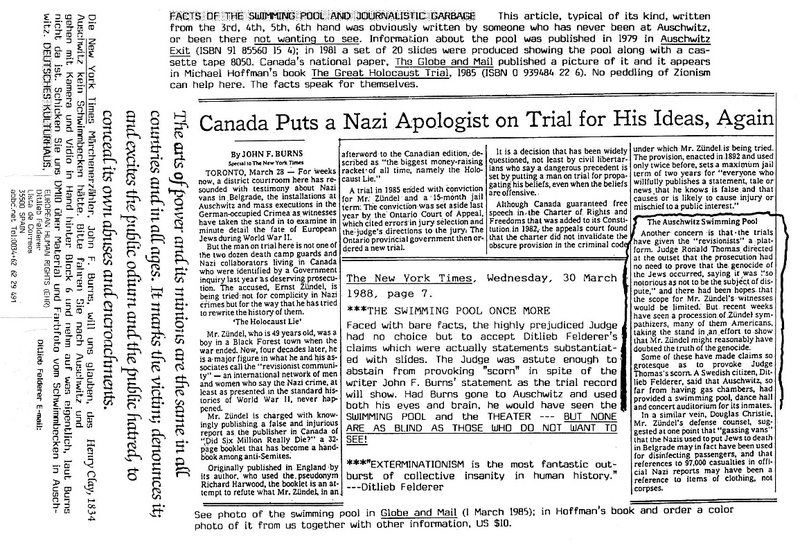 At a crucial moment in Censorship and Free Speech trial, New York Times, came out with the lie that the Auschwitz Swimming Pool was nothing but an invention of Ditlieb Felderer. 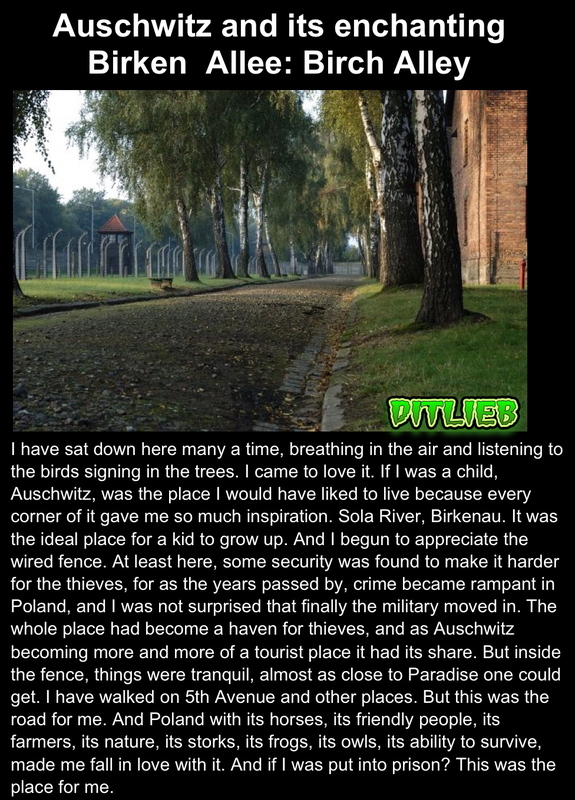 John F Burns, the article writer had by this time never visited Auschwitz Vomitorium to find out. 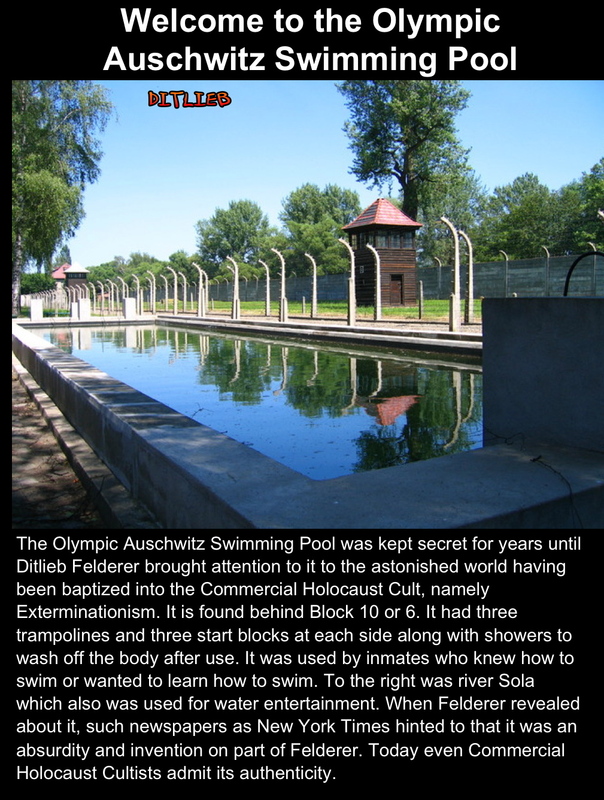 Sweden later in a Censorship and Free Speech Show Trial against Ditlieb Felderer picked up on New York Times article and had Ditlieb Felderer put inside Concentration Camp and tortured for his ‘lies’ about the Swimming Pool. 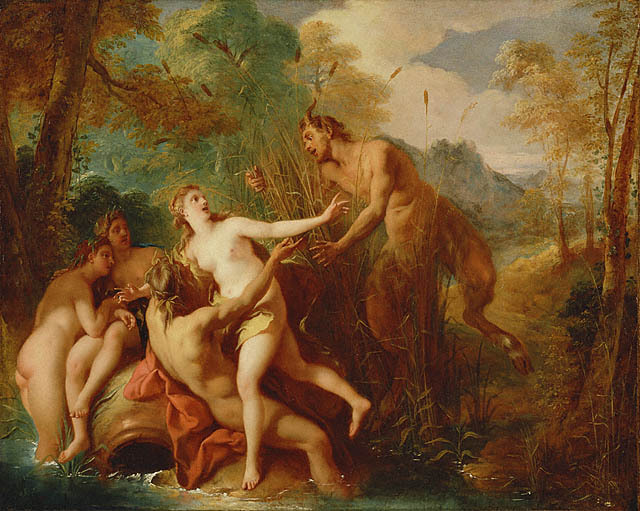 LIMITED SPEECH CONTRA UNLIMITED SPEECH Neither NBC with Brian Williams or anybody else in USA have ever discussed the curious fact why the American Fathers opted for Unlimited Speech instead of Limited Speech as in Europe. Why did they choose this when all of Europe had Limited Speech and felt it to be the insignia of their civilized state? NBC and the Charlie Hebdo affair thrive on Censorship and dupe the people in believing they have Free Speech. 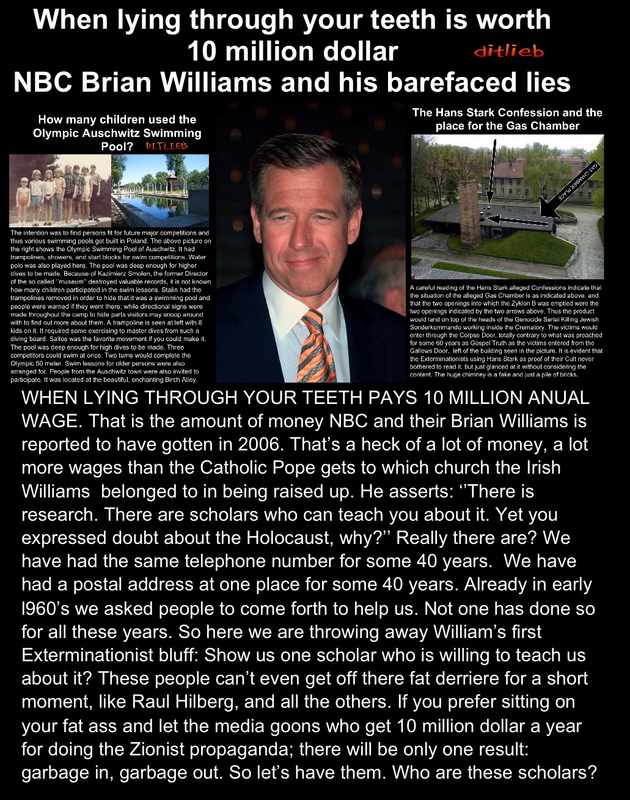 The meeting in Iran was about Censorship, instead NBC’s Brian Williams picks on the issue of deflecting the Pension Fraud Crimes away by using the Cult of Holocaust Extortion Cult. Brian Williams and NBC have not once covered the Free Speech state of either USA and Europe and tries to evade the issue in discussion with Iran’s Ahmedinejad. 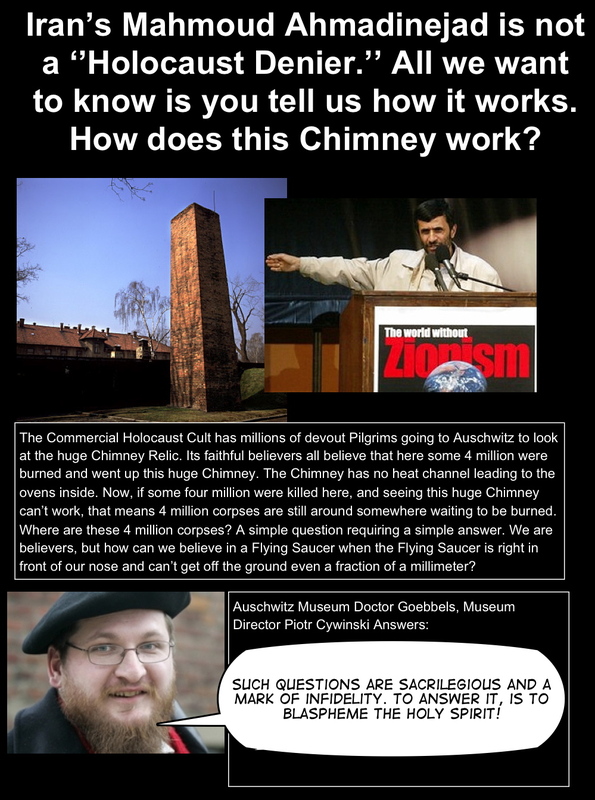 Question to NBC and Brian Williams about the fake Auschwitz Vomitorium chimney how it can work in getting ‘Six Million’ or more, ‘up the chimney’. What would the supposed ‘scholars’ answer be? Observe from the below: The fact is that the least the Exterminationists want to do is to sit down and discuss Doctrines which are often totally contrary to each other. The Exterminationists have already made up their mind. And all they need to do is to call for police. In Germany it is more than 5 years inside Concentration Camp for just doubting! THE MEDIA AND THEIR SLIME BALLS Now read again what Brian Williams says above, about a difference of Genocide and Warfare. 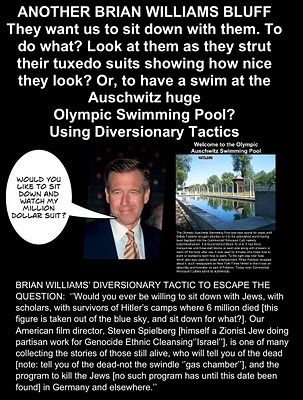 Here the slime ball Williams tries to bamboozle Iran’s Ahmedinejad in buying the yarn of ‘Genocide’ against Germany to help BBS Israel out; evidently most at Auschwitz Relief Camp, seeing it has been put on the top by the Holocaust Extortion Cult. Some 4 to 6, and even more, millions were to have been systematically exterminated there inside a Holy Shrine made by Stalin just next to an Olympic Training Swimming Pool. At times, Ditlieb Felderer, was given even higher numbers. And the Jewish Sonderkommando is to have administrated the whole killing operation. All the while, while the Jehovah’s Witnesses were decorating the whole area with flowers which were grown just beside the ‘gas chamber’! 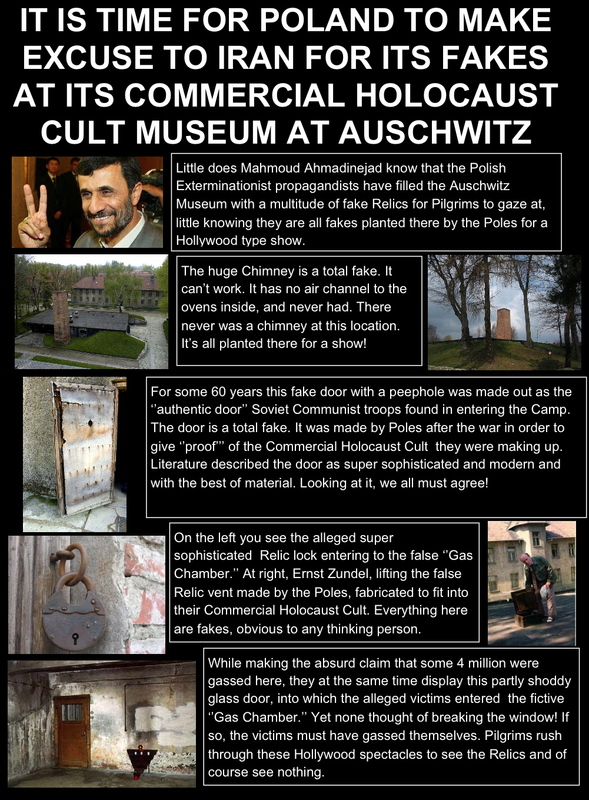 And while the Jews were dancing to the Jewish Orchestra playing their Auschwitz Waltz just by the Auschwitz Brothel! 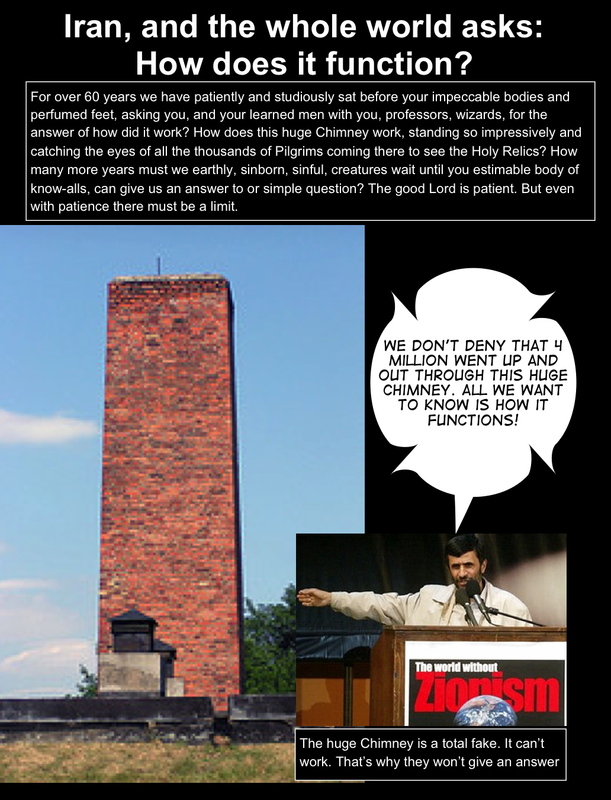 Please, await the next Monty Python comic here! One can say Brian Williams was ill-informed. But how can such a man with all the resources of NBC not bothered to inform himself of even the smallest things before setting off making a big fool of himself? Is money all there is to it? With money you make people do anything? Even this! MICHAEL HOFFMAN REPORTED OF THE ‘FREE SPEECH’ THEATRICAL SHOW IN 2009. REMINDING AHMEDINEJAD OF IRAN TO SIT DOWN TO LISTEN THEY THEMSELVES ALL WALK OUT NOT EVEN ABLE TO LISTEN FOR A SECOND. THE HYPOCRISY OF THE WEST AGAINST ISLAM. 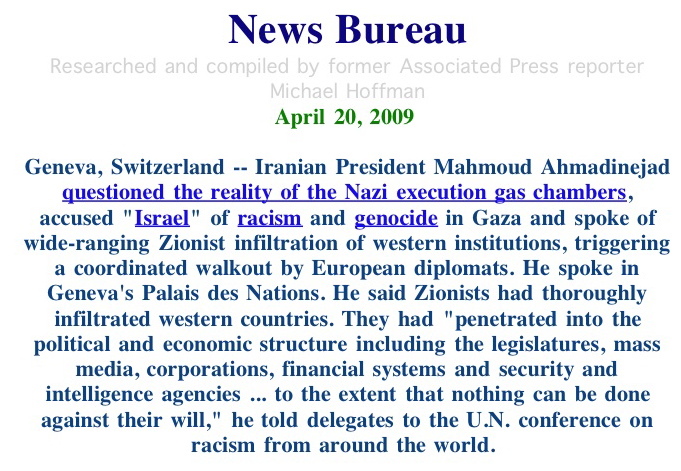 When Ahmedinejad of Iran wanted people to sit down and discuss the Holocaust Extortion Cult, the Western types, those who stood first in line at the Charlie Hebdo carnival, warning people not to forget Free Speech, they all walked out at Geneva when Ahmedinejad gave his famous speech! Evidently ‘hypocrisy’ is a term these refusals of learning is best fit with. So the ones who tell us to be tolerant and who stand first in line in Paris, France, for the Charlie Hebdo Carnival; to ‘show tolerance’, are extremely intolerant when haring things they fear would harm their image and hindering them from lining their own pockets and to feather their own nests. 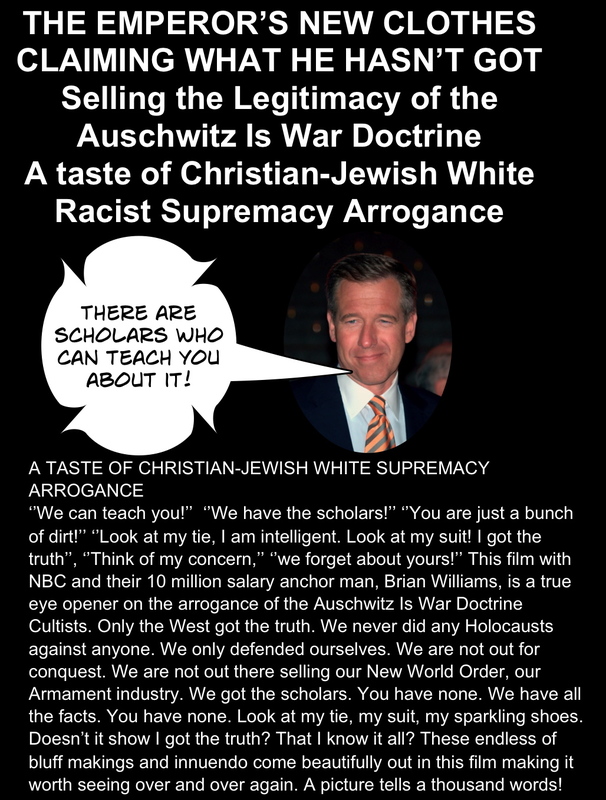 Brian Williams asks Iran’s Ahmedinejad whether he be willing to sit down and be educated about the Holocaust Extortion Cult, without of course its very ingredients of the Pension Fraud Crimes. 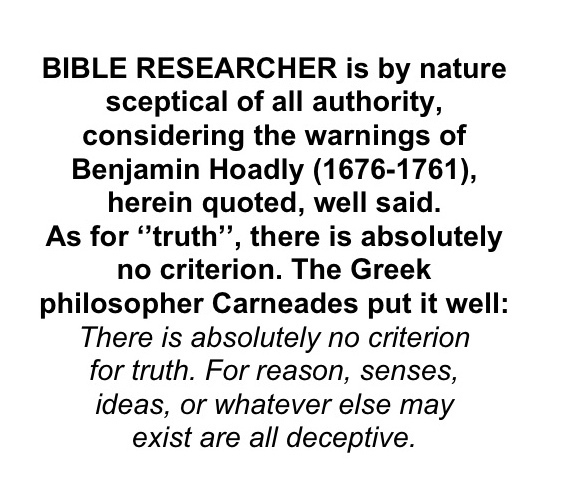 But evidently this is a one way road, for as we have seen above they all flee when faced with truth and facts. Their arrogance and bombastic demands have no limits. All they have are fast feet to run with when truth is put onto them. And Brian Williams has of course denied the slightest contact with us. It is all a matter of Bla….Bl-a-a-a-a-a-a, B-l-a-a-a-a-a-a-a-a-a-a-a-a-a-a-a-a-a-a. All these Bla-Blas all turn round when it came to the Charlie Hebdo anti-Free Speech Carnival for Censorship, telling the world how much they respect tolerance and Free Speech, when all they got is Censorship. Now take a close look at the picture below. All those people who denied Ahmedinejad his Free Speech and were so afraid to listen to him, are now standing first in line in Paris, France, at the Charlie Hebdo anti-Free Speech Carnival, on 11 January 2015 informing the world how much they love Free Speech, having denied it not only to Ahmedinejad, but to millions upon millions of their citizens! 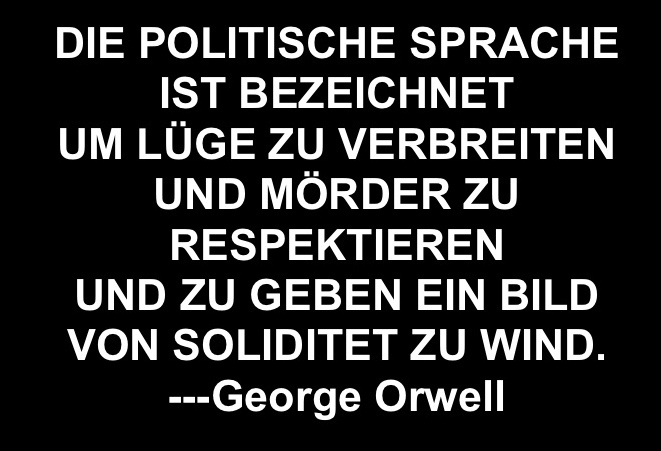 Some have even ready Concentration Camps, such as Germany, against Free Speech, giving you more than 5 years Concentration Camp torture for mere ‘doubt’. Can a lie be shown clearer than this here? Evidently hypocrisy has no bounds! Remember we are not like all your corrupt politicians but stand always ready to change our writing if we are found wrong. 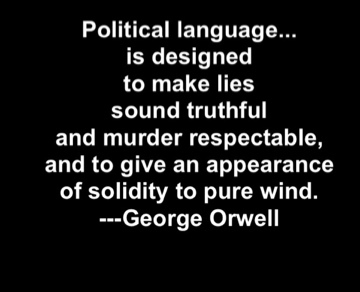 We are not like your corrupt Media and Politicians always ready to condemn Free Speech whenever it does not fit the line of monopolistic rulership amd dictatorial aims. That is why the Free Press and Media is superior to all the rest. In fact, it is the only thing worth listening and seeing if you want to be informed and remain your sanity intact. Previous Previous post: In Sweden they burn books, in Jordan and Iraq people; the Charlie Hebdo ‘Free Speech’ debacle, War Is Peace — The Show must go on! 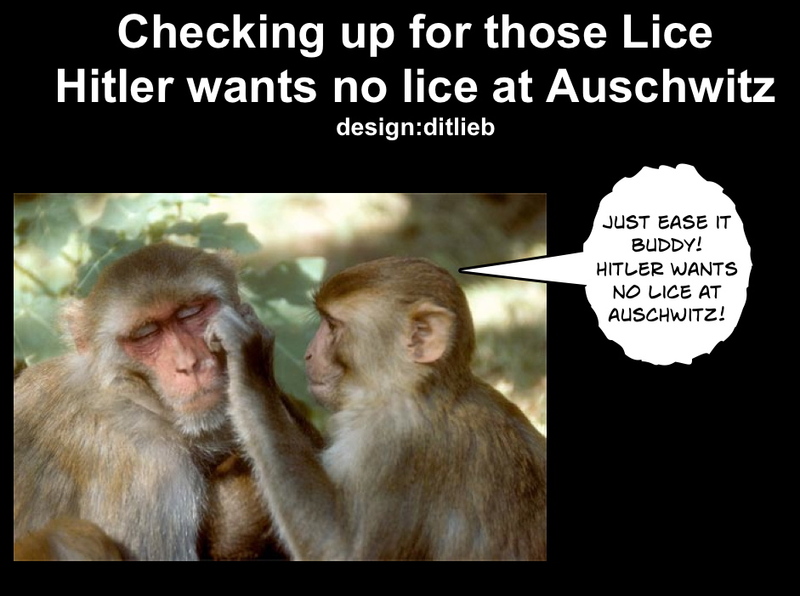 ditliebradio Brian Wilson of NBC biggest lie was not about his heroic Iraq experience but the bare faced lies he made against Ahmedinejad of Iran in order to cover up the Pension Fraud Crimes (PFC) and the frauds of the Holocaust Extortion Cult. 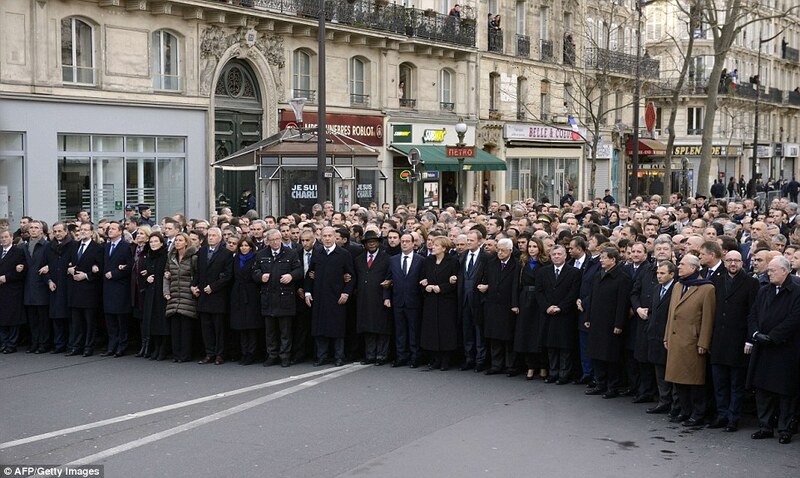 About the fraudulent Charlie Hebdo carnival in Paris 11 January 2015, and more.